Mr. Bundy gets a brand-new outfit…but he’s the only one in PS 88 that thinks it’s spectacular! In this clever twist on The Emperor’s New Clothes, acclaimed author Stephanie Calmenson turns a beloved fairy tale on its ear with the silly (mis)adventures of Mr. Bundy! Our Principal’s in His Underwear! 1 Greetings, Mr. B! Everyone at PS 88 knows that Mr. Bundy is the best principal in town. They also know that he’s the sharpest dresser. That’s why his students don’t want to miss a day of school. They like to see what he’s wearing. One day, he’ll have on a three-piece suit, with a crisply ironed handkerchief peeking out of his pocket. The next day, it will be a snazzy plaid jacket, with matching tie and socks. “Looking good, Mr. B!” his students always say. Word got around about Mr. Bundy’s clothes, and one day, a man and a woman who said they were tailors called on him. They handed him their business card. But they were not really tailors. They were tricksters. 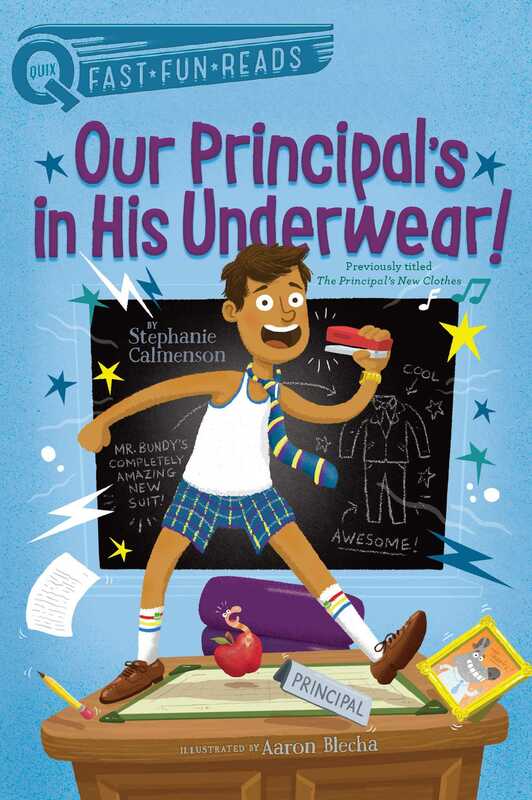 Book Cover Image (jpg): Our Principal's in His Underwear!